Sanders’ atmospheric US debut introduces a fascinating new ‘hero’, Marshall Grade, a former NYC undercover cop living off grid in New Mexico. A missing woman triggers Marshall to risk his cover, igniting violent confrontations with foes old and new. What about a partially finished manuscript from a rather unknown crime writer (in the Northern Hemisphere, at least) would inspire a Hollywood studio bidding war and one of the biggest stars in the world to sign up? A bloody good story, that's what. At heart, film producers, actors, viewers and readers all have one major thing in common - we love good storytelling. We want to be entertained, compelled, provoked. Nudged to think and feel. Caught up in a world of intriguing people, places, and events. Whether it's finding them, reading them, making them, or watching them, we're all on the hunt for great stories. 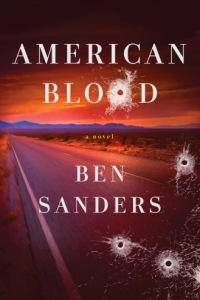 In his 'American debut', AMERICAN BLOOD, young New Zealand author Ben Sanders delivers just that. It wasn't Marshall Grade's decision to swap New York for New Mexico: a botched undercover operation did that for him. Now he's an ex-cop pretending to be something else, living in the dusty towns and desert of the Southwest. A man of good intentions and violent actions, mixing choices good and poor. His life of laying low and staying off the grid is upturned by his own sense of honor – or perhaps his wounded conscience – when a news story about missing local woman Alyce Ray catches his eye. Deciding to investigate alone, Marshall stumbles into a viper’s nest of drug dealing, gangs, and much worse. Meanwhile, his past hasn’t forgotten him either; there are plenty of people wanting to cash in Marshall’s final chit. While Ben Sanders might be a new name to most readers in North America and Europe, the young Kiwi wordsmith has a good pedigree. He honed his crime writing craft with a very good trilogy set in his hometown of Auckland - three tales which collectively topped bestseller lists, made the longlist and shortlist for the Ngaio Marsh Award, and saw Sanders' pithy, tense, action-packed writing compared to Lee Child. AMERICAN BLOOD shows a growing maturity from the 26-year-old storyteller: he's kept his whipcrack prose and exciting plotting, grown his already-good characterisation and penchant for delving into the violent, corrupt corners of society, and layered in a greater sense of atmosphere and philosophy. There's an expansive feel to AMERICAN BLOOD even if some of the action happens in claustrophobic places. In a way, AMERICAN BLOOD feels like a modern-day Western, with Grade an enigmatic gunslinger: violence in his blood, righteousness in his heart, conflict in his soul. It makes for an absorbing concoction, and I can definitely see why Oscar nominee Bradley Cooper is keen to produce and star in a film version. Powered by lean prose and dry humour, AMERICAN BLOOD evokes a gritty, seamy side of the Southwest, while delivering plenty of action layered atop some interesting moral questions. More importantly, perhaps, it heralds the arrival of a fantastic new protagonist who just screams for an ongoing series, and introduces a highly talented crime writers to a wider audience. Definitely worth a read. AMERICAN BLOOD has been published in the United States this month by Minotaur. It is scheduled to be published in New Zealand and Australia, under the same title but a different cover, by Allen & Unwin in the coming weeks.